West Midlands Campaign for Better Transport campaigns on local issues and supports the national organisation in pressing for sustainable transport. April 2018: It's the tenth anniversary of the English National Concessionary Bus Pass. The scheme has been enormously successful, providing much-needed access for elderly and disabled people to services. To celebrate this, and to call for investment in bus services and for the pass to remain as a national scheme, the TUC Pensioners' Network are undertaking a tour of the region (pictured right). 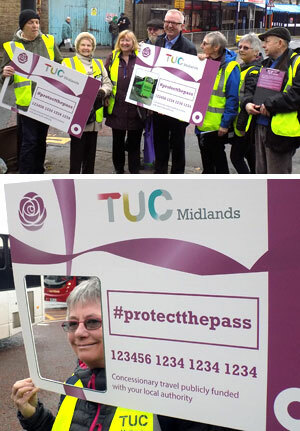 In the West Midlands they were joined by West Midlands Campaign for Better Transport. Find out more about the tour. November 2017: West Midlands Campaign for Better Transport has responded to National Express West Midlands' Dudley Area Network Review. March 2017: This press release from West Midlands Campaign for Better Transport asks why bus users in Birmingham can't have cheaper fares, plus why some bus users in Sandwell might not be able to benefit from the National Express West Midlands cheap fare zone. March 2016: West Midlands Campaign for Better Transport has responded to the consultation on the future West Midlands rail franchise. Read the group's response. September 2011: West Midlands Campaign for Better Transport is concerned about the withdrawal of a morning peak train from Kidderminster to Birmingham. "It is no way to run the railway," says Kevin Chapman in the group's press release (PDF). October 2010: West Midlands Campaign for Better Transport has been raising the issue of closed booking offices at London Midland stations. Stations in the Centro area should be manned from first 'til last train; however, booking offices have been left unstaffed after 2pm in recent weeks leaving some of the busiest stations around our area unmanned. We have passed the details on to Passenger Focus who will be checking whether London Midland are complying with their franchise obligations. If you spot a closed booking office that should be open, please contact the group giving the station, date and time. July 2010: The group has put out a press release (PDF, 65K) commenting on changes to bus services in Birmingham. It predicts that the plans will cause "chaos". West Midlands Campaign for Better Transport is also organising a petition against the plans to withdraw the 21 bus service; anyone who would like a copy of the petition form for distribution should contact the group. January 2010: West Midlands Campaign for Better Transport and Birmingham Friends of the Earth are working on a 20's Plenty campaign to get Birmingham City Council to adopt a 20mph speed limit on all residential roads within the city. This builds on the work done in Portsmouth where the council introduced a 20mph limit across the entire area. The group organised a forum in Central Birmingham following a letter writing campaign conducted over the summer and autumn, which got 500 residents across Birmingham to write to the city council calling for lower speed limits. The idea is to meet representatives of local neighbourhood forums and community groups who have issues with speeding in their areas and encourage them to campaign on 20's Plenty. December 2009: Kevin Chapman comments on Wolverhampton, the "hokey cokey" council as he calls it, where bus passengers continue to suffer from below-par reliability on one hand and are seeing their hard earned council tax being thrown down the drain on the other. November 2009: Rail passengers can put away those champagne bottles – despite headlines proclaiming that rail fares would rise by just over 1%, Kevin Chapman reveals that tickets for many journeys will rise by considerably more. March 2009: West Midlands Campaign for Better Transport used the Freedom of Information Act to obtain “Local Transport Plan Delivery Report: 2006 – 2008” which suggests punctuality is currently little better than it was in 2002/03, when 60% of bus services operated between one minute early and five minutes late. If current performance continues, West Midlands authorities will be well off track in meeting the 2010/11 target of 83%. February 2009: West Midlands Campaign for Better Transport is campaigning against the fare rises imposed by bus operator National Express West Midlands over the Christmas and New Year period. This group has been set up on Facebook to call for lower fares. December 2008: The group has called on the bus operator National Express West Midlands to postpone a fare increase planned for early January.